James McArdle & Andrew Garfield in "Angels in America"
Difficult to believe as it is, it has been twenty-five years since playwright Tony Kushner wrote his earthshaking Angels in America, a Gay Fantasia on National Themes. With its eclectic mix of the political and the mythical, featuring some highly original characters as well as some historical figures, its impression and impact on contemporary theater then and now remains an indictment of cynicism and hypocrisy. It, sadly, not only seems as relevant to today's American scene but in fact more relevant than ever. While the original work was written as a response to the faults of Reaganism, and the scourge of HIV/AIDS is no longer an automatic death sentence, we as a nation are still far from ideal; in fact, there is much more reason to protest and resist. Thus it should come as no surprise that London's National Theater should have chosen to remount the work, with a truly stellar cast and technical crew, directed by Marianne Elliott, which turned out to be a testament to both the original productions in May 1993 and November 1993, and their subsequent television miniseries version in 2003. 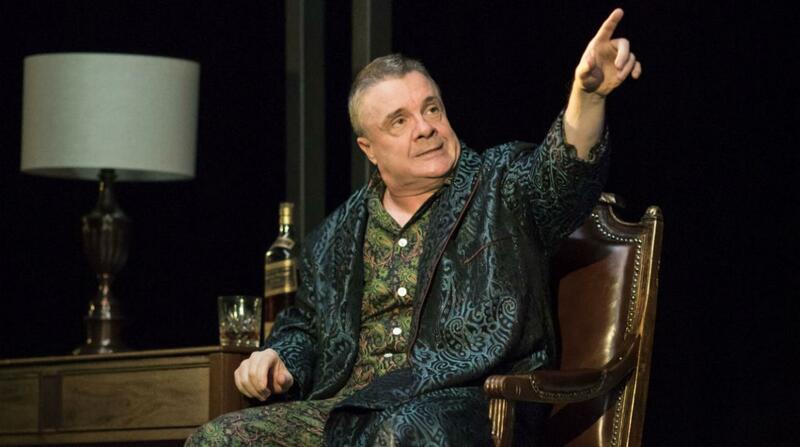 Nathan Lane in "Angels in America"
Kushner originally planned to produce the two parts of his masterwork in repertory, but the second part was delayed by a season, enabling him to win the Tony Award for Best Play twice in successive years, for both of the parts, in addition to many other accolades, including the Pulitzer Prize. Part One: Millennium Approaches, was, in a term the author himself used frequently, a threshold of revelation. The story line (or rather story lines) for both parts centers around two men suffering from AIDS, Prior Walter (Andrew Garfield, whose prior work as the hero of Spiderman and Hacksaw Ridge gave mere glimmers of promise) and Senator Joe McCarthy's right hand man Roy Cohn (the usually droll Nathan Lane in a ferocious departure from such roles as in The Producers and the like), and the reactions to their common disease from those around them, notably Prior's lover Louis (a boyishly endearing James McArdle), nurse Belize (Nathan Stewart-Jarrett), Mormon Joe Pitt (a convincingly conflicted Russell Tovey), Joe's wife Harper (the stunning Denise Gough) and mother (the versatile Susan Brown). And, of course, the first of many angelic presences (Amanda Lawrence). It's a cosmic melting pot with fundamentally political ends, as when a cynical Justice Department flackman Martin Heller (also played by Gough) declaims the “end of liberalism, the end of the New Deal socialism, the dawning of a genuinely American political personality”. Even Kushner couldn't have anticipated how prescient his vision was. Prior, through AIDS, perceives the absurdity of the world, while Cohn, ironically an anti-Semite Jew and homophobic gay man, sees the reality as a joke. Except the joke's on him, and it isn't funny. Part Two: Perestroika (which you will recall means a “thaw”), is longer, more verbose, more populated by celestial beings. It's also harder to follow, at least on stage, without benefit of the published play with its helpful stage directions. His characters increasingly talk over one another (a device he later perfected in his The Intelligent Homosexual's Guide to Capitalism and Socialism with a Key to the Scriptures). Suffice it to say that Kusher delves much more deeply into the realm of the mystical, with significantly increased roles for his supporting cast, notably Belize (who wasn't even named in the first part), Ethel Rosenberg (Brown again) and the weirdest of his cast, Harper's imaginary friend Mr. Lies (Stewart-Jarrett again), of the International Order of Travel Agents. It's a far funnier and more whimsical play than the first part, more poetic and less accessible at the same time. We are shown a Prior who is now ready to undertake his role in the Great Work that is to come. He interacts with Harper (both of them left by their loved ones) in looking into the past in order to ascertain America's answer for the future. Prior is ready for the chance for “more life” which was denied the more cynical Cohn; he has hope “to be around (for summer) to see it (Central Park's Bethesda fountain). I plan to be...This disease will be the end of many of us, but not nearly all...We are not going away. We won't die secret deaths anymore...We will be citizens. The time has come...And I bless you: More Life. The Great Work Begins.” And so it has come to pass, that declarations that Marx and God are dead were quite possibly premature. As the comic strip character Pogo once put it, “God isn't dead; he's just unemployed”. And yet the tiniest tinge of terror persists, with the knowledge that, for a period of a decade or so, Roy Cohn was a legal advisor to one Donald J. Trump. 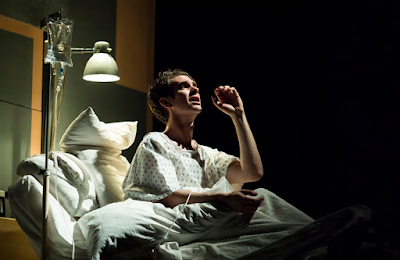 Andrew Garfield in "Angels in America"
Americana Theatre's "Lucky Stiff": Weekend at Tony's? 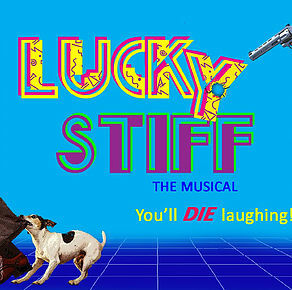 Ahrens & Flaherty's premiere musical "Lucky Stiff"
From the creative team that brought you A Man of No Importance, Once on this Island, Anastasia and perhaps especially Ragtime, comes the farce musical by the witty name of Lucky Stiff, which happens to be the first musical collaboration ever by the since-successful team of Lynn Ahrens (Book and Lyrics) and Stephen Flaherty (Music). Based on the 1983 novel The Man Who Broke the Bank at Monte Carlo by Michael Butterworth, it was produced off-Broadway in 1988 by Playwrights Horizon, where it lasted fifteen performances, subsequently produced in London's West End and revised as a film. Critics at the time remarked at how promising the fledgling work was, expecting great things from the duo in the future, which indeed came to pass. 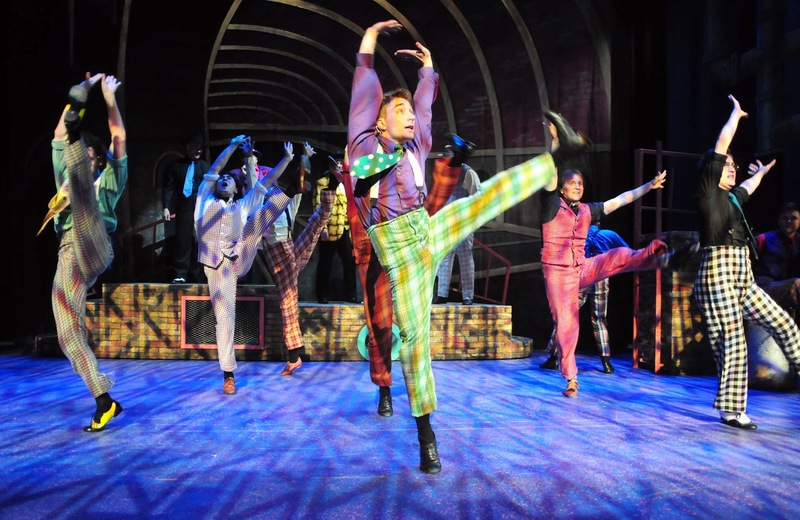 With a score that includes almost two dozen numbers (including reprises), it has come to be embraced by theater companies throughout the country. 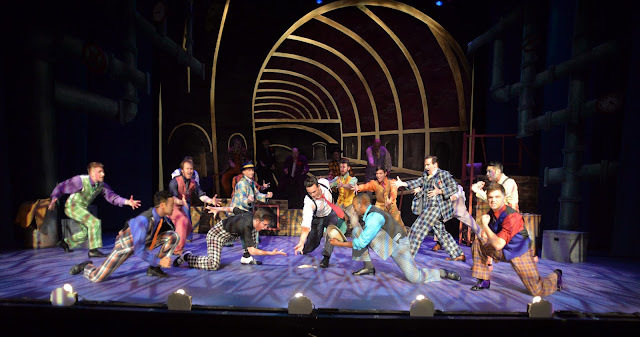 This latest Americana Theatre production at the Spire Center for the Performing Arts in Plymouth (through July 22) finally brings the opportunity for local theatergoers to experience this seminal work, which takes place in the present in England, Atlantic City and Monte Carlo. Think of it as “Weekend at Bernie's, the Musical”, if you like. (That film opened a year later than this musical, in case you were wondering who had the idea first). The story concerns the plight of one shy English shoe salesman, Henry Witherspoon by name (Jessie M. Sullivan), living in an East Grinsted boarding house bursting with colorful characters and a herd of dogs. (Henry hates dogs). The landlady (Erin Friday) and her other boarders intercept a telegram meant for Henry which informs him he's about to inherit six million dollars from his recently deceased Uncle Tony (Brigdon York), a casino croupier, with a catch. Henry learns from his solicitor (Brian Kenerson) that in order to collect, he must (successfully) take his Uncle Tony's corpse to his dream destination, Monte Carlo, for a week, or the fortune will revert to the Universal Dog Home of Brooklyn, represented by Annabel Glick (Katie Johangten). His landlady and fellow boarders have other ideas, from the deceased's nearsighted girlfriend Rita La Porta (Hannah Jo Weisberg) to her mild-mannered henpecked brother Vinnie Di Ruzzio (Derek G. Martin), an optometrist, as well as a seductive nightclub chanteuse named Dominique du Monaco (Jennifer Martin), a would-be guide, Luigi Gaudi (David Friday) and Nick Hancock in multiple roles. Plot twists ensue. Fortunately for you the reader, space considerations rule out a more comprehensive synopsis of the plot twists and turns, which would be stultifying, and best seen in person. As in all such complicated capers, all's well and ends well, more or less. As Directed by Brance Cornelius, the company performs at breakneck pace, accompanied by pianist Nicole Sjolin (the Music Director is Nancy Sparklin), with suave yet simple work by Choreographer Derek G. Martin, clever and versatile Set Design by David Friday, colorful and creative Costume Design by Brian Kenerson, and some really brilliant props (Props Master is Erin Friday) including an umbrella roulette wheel (which you'll have to see to appreciate). The work by Ahrens and Flaherty is fundamentally a one joke premise, with often cute, if too predictable, lyrics and a score that is mostly musical recitative rather than a series of melodies though two songs, “Times Like This” and “Nice”, stand out. There's an inside joke about a Mr. Butterworth (the author of the source novel), and timing that clearly shows this cast was extraordinarily well rehearsed, and one might question whether these talented artists need miking in such a relatively compact venue. While they're uniformly memorable, one should note the chemistry between Sullivan and Johangten, the smooth movement by Kenerson and the sultry singing by Jennifer Martin. All made for a fun summer evening with some a-Spiring future stars. 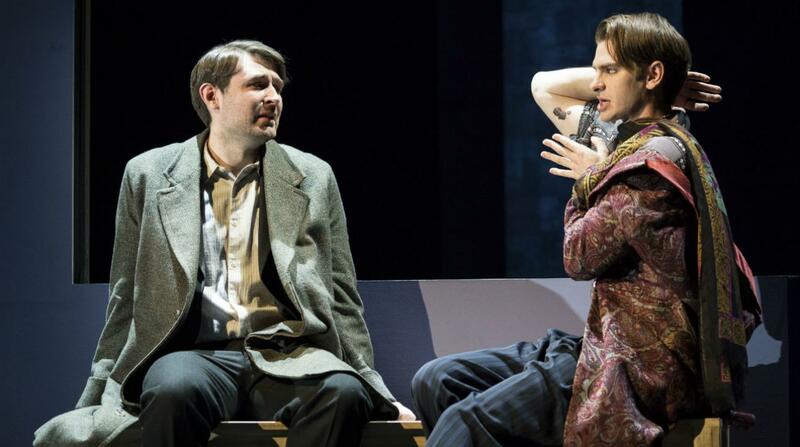 Ogunquit's "Bullets over Broadway": Don't Speak! Vincent Pastore, Reed Campbell & The Ensemble of "Bullets over Broadway"
There is more talent on display on the stage of the Ogunquit Playhouse in its current production of Bullets over Broadway the Musical, a work written by Woody Allen, than on any ten stages anywhere today. Based on the 1994 film written by Allen and Douglas McGrath, it's a shame all that talented energy isn't being put to more use than this virtually empty play. Produced on Broadway in 2014, it ran only156 performances. The musical follows the original screenplay fairly faithfully, focusing on the first play by novice David Shayne (John Rochette), to be premiered on Broadway by Julian Marx (Kenny Morris), financed by wealthy gangster Nick Valenti (Vincent Pastore, recreating his role from the New York production) who requires that it feature his girlfriend Olive Neal (Jemma Jane). 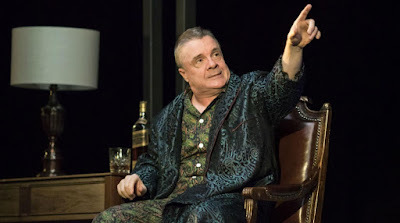 Valenti appoints his henchman Cheech (Reed Campbell) to monitor the goings-on, but Cheech ends up making some important changes in the play, while leading man Warner Purcell (John Paul Almon) ogles Olive. Aging diva Helen Sinclair (Michele Ragusa) makes a play for the young playwright, who already has a girlfriend of his own, Ellen (Bridget Elise Yingling). Also on hand are the imposing character of Eden Brent (Ogunquit favorite Sally Struthers) and her dog Mr. Woofles. As Helen Sinclair declares in the famous oft-repeated line in the film, “Don't speak!”. So they don't very much, leaving a lot of exposition to the choreography originally devised by Susan Stroman and recreated here by Director Jeff Whiting, as well as to the score. The dancing is clever and contributive, which is more than one can say about the musical numbers borrowed from many sources, with such songs as “(Up a) Lazy River”, “I'm Sitting on Top of the World”, and “There'll Be Some Changes Made”, many of which have little to do with any significant context to the plot. There are some twenty such old timers (and five reprises). With some additional lyrics by Glen Kelly, they run the gamut of jazz and pop standards from World War I to the 1930's. But no one seems to care about them in the end, preferring to wallow happily in the nostalgia of it all. Reviews for the Broadway production, especially concerning the “jukebox” musical style, were decidedly mixed. Here, the musical direction by Robbie Cowan, Sound Design by Ken Goodwin, Lighting Design by Richard Latta (an IRNE winner for last season's Hunchback of Notre Dame), and Costume Design by William Ivey Long (from the Broadway version) are all superior work. The performances are also memorable, from Ragusa (a powerhouse), Jane (hysterically dumb) and Campbell (menacing), not to mention Struthers, who's unfortunately given little chance to share her estimable theatrical chops, relegated to speaking ig-pay atin-Lay and sing one number as a dog. Really. The gangsters dance wonderfully if weirdly as they mimic various crimes. But it's the fundamental crudity and crassness that one remembers, not even at the level of vaudeville but burlesque, offensive and dumb, veering from the amoral to the immoral, which may sound prudish, but there you are. Add to this several severely underdeveloped characters and some wildly inappropriate (considering their original contexts) versions of songs, such as “Taint Nobody's Biz-ness If I Do”, and the work approaches what one character declares as “new heights of vacuousness”. It's a hodgepodge that reminds one of building Frankenstein from spare body parts. At one point Ragusa declares “don't sing”, but they do. The show left some of the audience nearly orgasmic with joy, while some left early, an option, alas, not available to critics. MSMT's "Guys and Dolls": What the Fugue? The Cast of "Guys and Dolls" in the number "Luck Be a Lady Tonight"
As this site has noted in the past, you know you're not in Kansas anymore when the opening number of a musical is entitled “Fugue for Tinhorns”, and it's still true, as Maine State Music Theater in Brunswick presents the much-beloved 1950 musical “Guys and Dolls, A Musical Fable of Broadway”. With Music and Lyrics by Frank Loesser and Book by Abe Burrows (who rewrote the first draft by Jo Swerling) based on the popular underworld stories of Damon Runyon, its original Broadway incarnation won five Tony Awards including Best Musical, and ran for an incredible 1200 performances. It also was about to be chosen to receive the Pulitzer Prize, until the Pulitzer board learned of Burrows' contretemps with the House Un-American Activities Committee. It has seen several successful revivals since, and was made into a largely forgettable 1955 film that miscast Marlon Brando, Jean Simmons and Frank Sinatra. The play, praised for its faithfulness to the source material in style, characterizations and above all Runyon's depiction of the patois of the world of really-off-track-betting, it has endured in large part due to its unbelievably melodic and topical score. Besides its title song, there are a dozen and a half wonderful hits, such as “Luck Be a Lady”, “I've Never Been in Love Before”, “I'll Know (When My Love Comes Along)”, and “If I Were a Bell.” Then there are the comic songs such as “Sit Down You're Rockin' the Boat”, “Sue Me”, “The Oldest Established (Permanent Floating Crap Game)” and, perhaps the ultimate show-stopper, “Adelaide's Lament”. It's no wonder most experts include it as one of the handful of all-time best Broadway musicals. The Cast of "Guys & Dolls" in the "Crapshooters' Dance"
The musical magic begins, as noted above, with that groundbreaking opener, “Fugue for Tinhorns”, a very complex (for Broadway, anyway) contrapuntal composition that perfectly sets up the story to follow. In a mythical New York, having been thrown out of the local Save-a-Soul Mission for conducting an illegal crap game there, Nicely-Nicely Johnson (Steve Gagliastro), Rusty Charlie (Raymond Marc Dumont) and Benny Southstreet (Brad Bradley) and their boss Nathan Detroit (James Beaman) need money to relocate, so Nathan makes a bet with inveterate gambler Sky Masterson (Stephen Mark Lucas) about taking a “doll” to dinner in Havana (how topical as well as tropical), with Sergeant Sarah Brown (Kristen Hahn) of the mission as the target of the bet. Nathan leaves to attend the night club act of his “doll”, Adelaide (Charis Leos), to whom he's been engaged for fourteen years, while Sky makes a very unsuccessful play for Sarah, even though promising to send the mission a dozen sinners. Sarah relents under pressure from her boss, General Cartwright (Cathy Newman) to produce genuine sinners, and flies off to Cuba with Sky, realizing once there (in Bacardi veritas) that she's in love with him. On their return, she realizes just where the floating game drifted, namely her beloved mission, and assumes that's why Sky got her out of town. She complains to her mission co-worker, Arvide (Glenn Anderson), but he urges her to follow her heart. Meanwhile in the sewers of the city, Sky falsely states that he failed to take Sarah to Cuba and makes a bet to all present, including Chicago gangster Big Julie (Danny Rutigliano), of $1000 each against their attendance at the mission. Sky wins, the gamblers attend a mission service, the local cops led by Lt. Brannigan (Joe Gately) are satisfied, and everyone ends up a winner, Sarah with Sky, Adelaide with Nathan. Simple, yes? Deceptively so, as the show calls for a secure grasp of what the Runyonland folk are really like, especially with respect to the lower-level New York accents. (Many are those amateur versions that “rock the boat” in the wrong way). It also calls for respectful hands that can balance the seemly with the seedy, the lyricism with the lowlifes. In this production, the Direction and Choreography by DJ Salisbury are superb, with many fine touches. The cast is up to the challenge, from the first note delivered by the outstanding Bradley with memorable performances by all, most notably the hilarious Beaman (an IRNE winner for Nice Work If You Can Get It at Ogonquit Playhouse) and Leos (the latter unforgettable in her rendition of “Adelaide's Lament”). The technical aspects, from the tongue-in-cheek Costume Design by Ryan Moller, inventive Scenic Design by Robert Andrew Kovach, Lighting Design by Annemarie Duggan, Sound Design by Shannon Slaton, and the Music Direction by Brian Cimmet are all terrific. Fair warning: there's little subtlety in the telling, but it's prime rubber chicken comedy nonetheless, right down to Nicely-Nicely Johnson's trombone turn. The chemistry between Lukas and Hahn is palpable. It's a glorious night at the theater, playing through July 15, far above and beyond all the other floating crap games around. And need one be gently reminded that, for Boston residents, MSMT is a mere hour and a half or so away by car (or, more relaxing, Amtrak's NorEaster)? You've got the house right here.